In all workplaces, there need to be adequate first aid kits. There will be trained first aiders in the business, but it is a good idea to find out who the first aiders are and what is in the first aid kit. In a kitchen, there is usually also a burns kit. Catering first aid kits usually contain blue plasters and dressing to make them show up better if they enter the food and they have metal strips so that they can be picked up by metal detectors in the food processing process. The size of kit you need will vary on the risk assessment you have carried out and you may need more than one kit. The kits are available in small, medium and large sizes. The first aid at work regulations gives more guidance to what you need. Need to buy a kit? 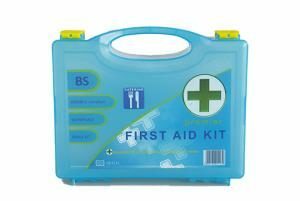 click for our range of first aid kits for catering. If you require food safety training contact us for more details. Click for more information on our Appointed Person First Aid course.